Our Mexican food is the tastiest. Our chefs offer you perfect cooking - the very best served dishes made with the freshest ingredients. We have the taste of old Mexico that you won’t find anywhere else in the area, with recipes handed down from one generation to the next. We also offer the best happy hour specials around! Come in and taste our homemade tortillas, or delicious tortilla soup! A creamy, cheesy and spicy dip melted to perfection. Chicken and Monterey Jack cheese rolled up in a flour tortilla and fried golden brown. Topped with spicy cream cheese sauce and cheese, then baked in the oven. Served with sour cream and guacamole. Fries covered in jalepeno’s and melted cheese. Topped with your choice of carne asada or bacon. Cheese quesadilla, corn taquitos and tamales. Served with guacamole and sour cream. Comes with carne asada, guacamole, cheese, french fries, pico de gallo, and delicious ranch chipotle sauce. Grilled chicken, bacon, cheese, lettuce,tomato, guacamole and chipotle ranch in a flour tortilla. A Chile Relleno, rice, beans, sour cream and cheese. Meat of your choice, rice, beans, and cheese topped with lettuce, pico de gallo and your choice of sour cream or guacamole. Add $0.75 for both sour cream and guacamole. Meat of your choice, rice, beans, and cheese, pico de gallo, lettuce, choice of guacamole or sour cream. $7.75 Add $0.75 for both sour cream and guacamole. Tender skirt steak charbroiled and topped with grilled onions. Comes with onions, bell pepper and guacamole. Our savory sour cream parmesan cheese sauce tossed with chicken. Delicious rich mole sauce tossed with chicken. Sautéed chicken in our homemade chipotle sauce (slightly spicy). Tender chunks of pork, slow cooked in a green jalapeño chile sauce, garlic and tomatillos and topped with cheese. Shrimp, onions and mushrooms sautéed in a sweet and spicy red sauce. 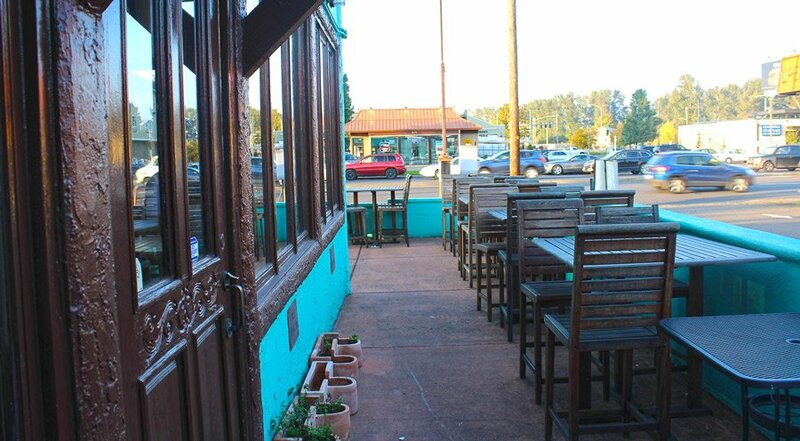 Enjoy your meal or drinks on our outdoor patio. You’ll find it a very enjoyable, comfy way to hang out and relax (providing the weather cooperates). You’ll receive the same high-quality service from our staff as you would be seated indoors. Plus you’ll be closer to our bar, so you can chill with your favorite margarita or cocktail! Whether it's your first time here, or you're a regular with us, we promise to provide the best, traditional Mexican cantina experience we can! We'd love to hear how your meal was - click the peppers below to let us know how we're doing. We take pride in using meats and vegetables (and other ingredients) only from farms local to the Pacific Northwest. You must try a guava margarita- they are certainly the talk of the town. Or come during our Happy Hour for the best deals on margarita pitchers and tequilla drinks! Inspired by the tastes that come from Mexican plazas, Chula's shares authentic recipes that may not have you going home with leftovers. Come enjoy our homemade tortillas, soup and other Mexican specialties! Sopapillas, Fried Ice Cream & Flan, oh my! Events, corporate lunches and more! Are you planning an event or gathering in the University area? Let us provide the meal! Taco and enchilada trays, tortilla soup… So much delicious food to choose from. The only thing we don’t have plenty of is parking. Carpool or walking to Chula’s may be your best decision. Our parking lot is small! 610 E. Broadway, Eugene, Ore.